The Galapagos Islands are a magical and almost mythical isolated archipelago. They are readily accessible to tourists, many of whom travel as part of an organized tour, guided by experts who are a mixture of seasoned seafarers, and wildlife specialists. "Although in oceanic islands the species are few in number, the portion of endemic kinds is often extremely large." The Galapagos Islands are situated 1000km off the west coast of Ecuador almost exactly on the equator, there are 13 major islands, 8 smaller islands and 40 islets. 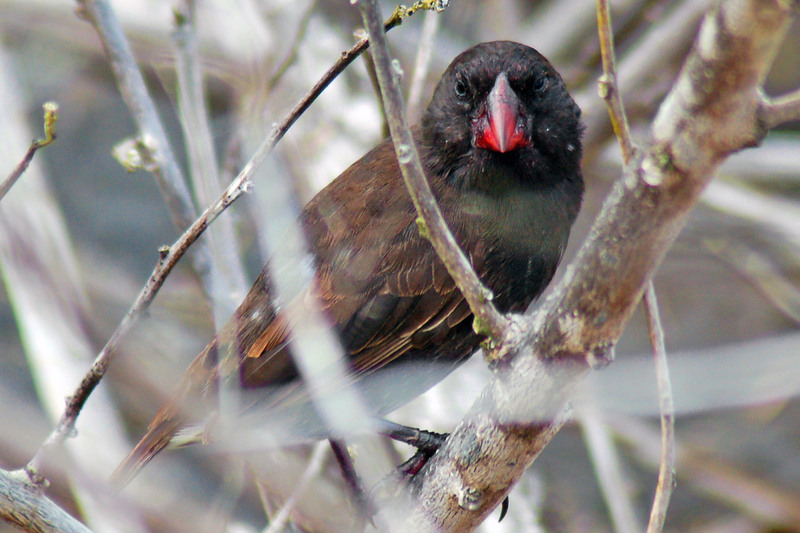 A Cactus Finch, The Galapagos are unusual in that they have a group of birds called finches which have evolved to fill a number of niches normally filled by other birds. This group of closely related species are known as "Darwin'd Finches" this particular species is usually found around Opuntia cactus plants. Picture - Peter Wilton used under CC2 Attribution Share Alike Generic license. tree-like cactuses and underlying scrub. Picture - Joanne Goldby from Birmingham, used under CC2 Attribution Share Alike Generic license. The best way to visit the Galapagos Islands is as a part of a guided tour aboard a small cruising vessel, which functions as 'floating home' for the duration of your visit. Ships anchor aside islands and passengers are ferried ashore on pangas (small zodiacs) twice a day. Each island offers a different experience. Trained naturalists help travelers while ashore interpreting the islands' wildlife. These guides make nature come alive. 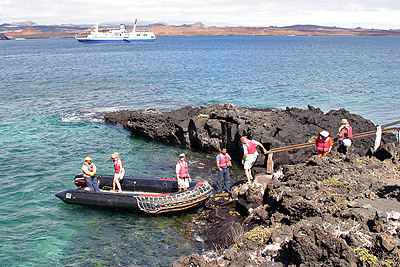 Visitors to the Galapagos must be accompanied at all times by guides who have been trained by the Charles Darwin Station and licensed by the National Park. These guides are intimately familiar with visitor sites and will share their wealth of knowledge with you daily. In the evenings, they will give briefings on the following day's events. Visitors fly first into Quito or Guayaquil, Ecuador, and then take a flight from the mainland to the islands. Here you can explore the environment that amazed Charles Darwin amongst other ship's naturalists in past centuries with its collection of exotic and unusual wild-life that wanders as freely and fearlessly today as it ever has. From cold-water penguins to marine iguana and blue-footed boobies, this volcanic archipelago continues to amaze visitors of all age. 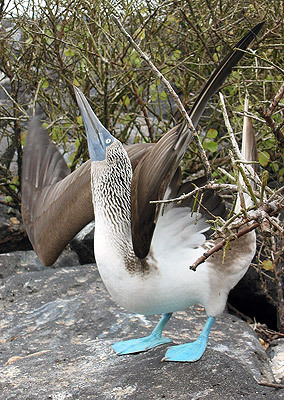 Each day of a Galapagos cruise will take you to new rich and varied sites. You may be Snorkeling among sea turtles, playful sea lions, or Galapagos penguins. On land you'll see giant Galapagos tortoises creep slowly through lush green meadows, or climb to the rim of one of the largest volcano craters in the world. Cruises are offered in 4 to 11 day programs, we recommend at least an 8-day cruise. 7-8 day cruises - Classic - visit a number of islands, see a wide variety of wildlife, snorkel several times in different locations. 10-11 days in total with travel time. 9-12 day cruises - In-depth - greater time to see more of the wildlife of the Galapagos, birdwatchers and other naturalists will appreciate the opportunity to see more species in more locations. 12-15 days in total with travel time. 4-6 day cruises - In-brief - for those with limited time or with young children. This short time is not recommended alone for a cruise as it seems very brief after travelling so far to arrive in the Galapagos, it is best combined with a land programme either in the Galapagos, in Ecuador or other South American countries. Rates from $1,662 per person for a 4 day trip. For an 8 day trip with plenty of "features" and variety and a ship with a good level of comfort, expect to pay around $4,500 - $6,500 per person. More affordable trips are available as are more fully featured trips of 11 days from about $6,500+ per person, there are also longer trips of up to 17 days that can take in Peru also. Family trips, some cruises cater particularly for families, child rates for aged 12 and under, or discounts for the under 21's - details vary with the specific cruise. Flight tickets to Galapagos from Quito or Guayaquil - These can be booked at a rate of around $450 - $600 per adult. They must be booked at the same time as the cruise, we can do this for you, rates subject to change. Ecuador National Park entrance fee of $100 per adult and $50 per child (12 years and under at time of sailing) will be due at time of final payment. The Islands are part of the National Park system. Galapagos Transit Card ($20 per person) paid in cash upon arrival to airport. When do trips take place? 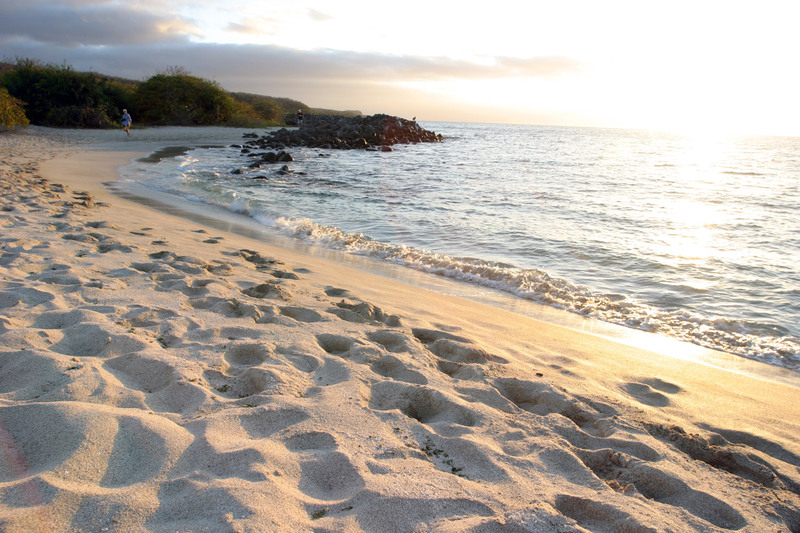 Situated on the equator, the Galapagos is an excellent year-round destination. There is no "bad time" to visit. Most of the seabirds and reptiles nest year-round, so you will likely see courtship, mating, chicks hatching and rearing at any time of the year. It is worth bearing in mind that being on the equator, the sun rises at 0600 and sets at 1800 with very little variation throughout the year, so it is always worth making an early start to make the most of the available daylight hours. Weather - Early mornings and late evenings can be cool, and mid-day can be very hot. Overall, the a Islands have a surprisingly cool, sub-tropical climate caused by the Humboldt and Peruvian currents, despite their situation on the equator. The Islands only receive an average of ten inches of rainfall per year. 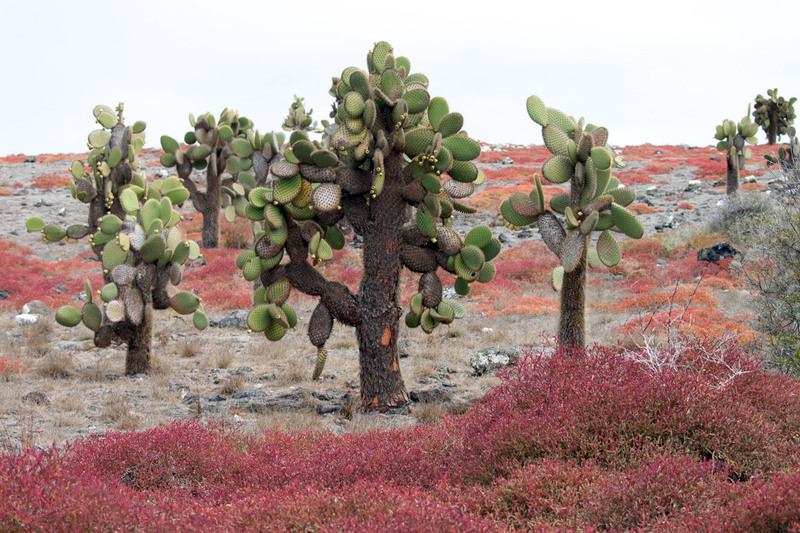 Coastal areas are dry and arid, while the highlands receive enough rainfall to support lush vegetation. Some months are warmer than others of course. The temperature in the islands ranges from an average of 19C / 66F in September to 26C - 32C / 80 - 90F (December - March), and 21C - 26C / 70 - 80F during other times of the year. In recent years, however, climate changes have made weather predictions more challenging. January - May: Warmest time of year; Slightly more rainfall; Lower elevations tend to stay arid; Ample blue skies and sunshine; Sea is calmer and at its warmest. June - December: Air temperature slightly lower; Garua season (Garua: a mist that forms in the highlands, providing moisture); Antarctic Humboldt coming from the south causes slight drop in the water temperature; September is typically coolest. Are the Galapagos a good destination for children, families, seniors? The magic of the Galapagos captivates people of all ages, from youngsters to seniors, and truly brings out the child in everyone. Daily morning and afternoon activities - whether its hiking, beach combing, snorkeling, or enjoying a Zodiac trip - give you the opportunity to spend most of your time "off ship" exploring wildlife and vegetation of the islands. However, it is also important to note that these trips have a great deal of flexibility, meaning you can choose the level of difficulty of an activity, and you can, of course, opt to not participate in an excursion. 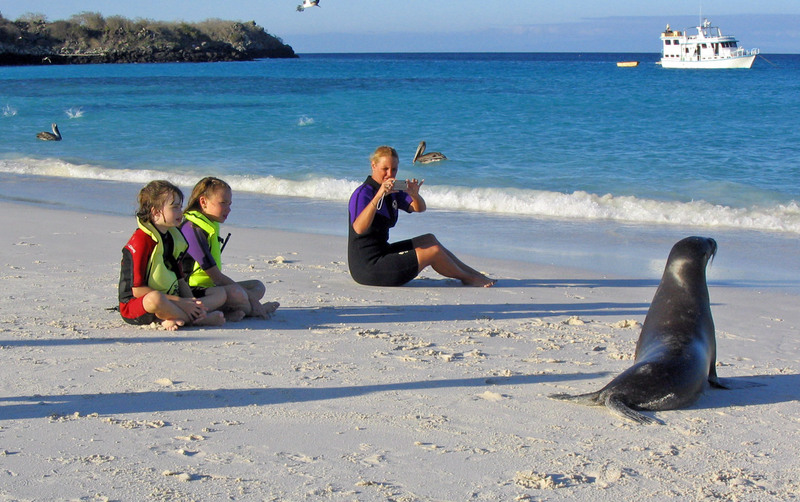 The Galapagos is a wildlife wonderland for children! We have had the opportunity to travel through the islands with children ourselves, and have seen, first-hand their curiosity and enthusiasm to snorkel two feet away from a sea lion pup, hike past dancing blue-footed boobies, and admire a 170-year-old tortoise! The islands give children an opportunity to gain a sense of connectedness to nature, which for many is a new phenomenon, as well as a chance to learn without even realizing! Cruising in such an environment means that it is the passengers who are "in the cage" and the wildlife outside free to roam. The boats and ships move around readily from island to island making travel very relaxed and comfortable, always surrounded by full facilities and the freedom to move around the vessel. Conversely with many cruises however, shore-trips are regular and there are not protracted periods of sailing in open sea. Activities are on the basis of doing as much as you want, if you simply don't want to join an excursion, you don't need to, pick and choose according to ability and preference. Certain cruises are specifically aimed at families with family oriented facilities and activities and of course a greater chance that there will be other children on the vessel for new found friends - always a boon for the parent on holiday! Note: The National Park System asks that visitors be at least 7 years old to protect the wildlife, the nesting habitats, and the welfare of the child. The advantages to sailing on a smaller vessel are many. A smaller group size feels more expeditionary and less crowded when you go ashore. These vessels include motor and sailing vessels and range from basic to luxurious. All offer an intimate and personal atmosphere. Kayaks are typically available onboard as another method of exploration. One of the few drawbacks is that there is little privacy and passengers have only one guide, and therefore one trained perspective. Galapagos cruises aboard larger vessels offer a high level of comfort, a variety of facilities - lounge, library, snorkeling equipment, hospital, lecture room, pool, gift shop - and a wide range of accommodations, from single cabins to suites. The 'style' of ship varies from expedition to cruise ship-like, and all have the ability to travel further distances, thus allowing you to see more in a short amount of time. There is a wide selection of food, onboard snorkel gear and wetsuits, and several different guides. Aboard mid-sized ships, you can enjoy the comfort and speed of a larger vessel, while travelling with a smaller group. These vessels are slightly more spacious, allowing more privacy, and offer more cabin category options. Additionally, they are generally more luxurious than smaller vessels, often with added amenities such as Jacuzzi, pool and more common areas (i.e. lounge, solarium, bar. Unlike smaller vessels, these ships have 2-4 naturalists aboard as your guides, which can bring a greater breadth of knowledge onboard. 1) Dive-only programs are for travellers wanting to spend most of their time exploring the underwater world of the Galapagos. A diving itinerary typically consists of two to three dives a day along with land visits to the islands. At certain dive sites, there may be as many as four dives a day, and, night dives are also provided if conditions are good. 2) Active departures offer a combo itinerary of both diving and other activities, such as hiking and snorkeling. These cruises appeal to both divers and non-divers, as passengers are not limited to a specific activity. 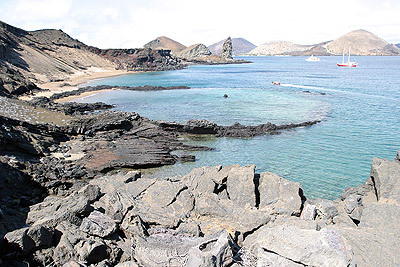 Diving in the Galapagos Islands has long been recognized as some of the finest in the world. Galapagos offers a diversity of endemic marine and plant life found in no other place on earth. However, Galapagos divers should understand that the Galapagos is a technical dive site and should be attempted only by certified experienced and advanced divers. Cold water currents and strong up swellings in different parts of the archipelago can produce sea temperatures as low as 10C / 50F although the average is nearer 20C / 67C throughout most of the year. During the warmer season, from December to March, water temperatures rise to about 24C / 75F. The Galapagos Islands are part of the South American country of Ecuador. They lie almost exactly on the equator at latitude: 0 54' South, longitude: 89 36' West. They are 1,088 km / 676 miles from the nearest large city on the mainland - Guayaquil and 1,236 km / 768 miles from the capital city of Quito. 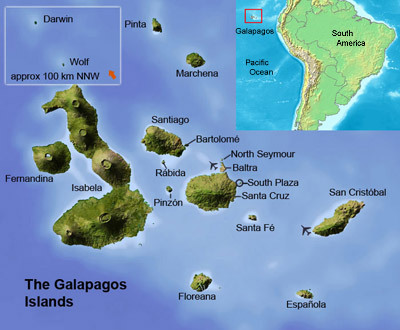 The Galapagos group consists of 13 major islands, 8 smaller islands and 40 islets. There are 3 airstrips on the larger islands of Isabela, Santa Cruz and San Cristobal, the latter two being international. The population is growing with 26,640 people in 2012, four of the islands Isabela, Santa Cruz, San Cristobal and Floreana have major settlements. Total sea area is 45,000 square kilometers and total land area is 7,882 square kilometers. Ecuador declared the Galapagos a wildlife sanctuary in 1935 and they were named a World Heritage Site in 1978 by UNESCO. 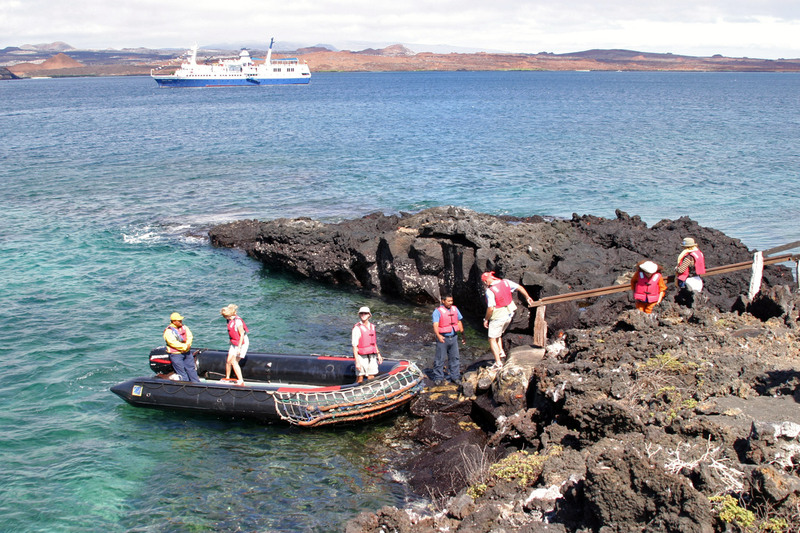 Groups of scientists and travellers from Ecuador and all over the world visit Galapagos National Park. To minimize the effects of tourism on the animals and unique environments, the park has established strict rules, including no camping on the islands. Visitors must overnight on ships. About 60,000 people visit the archipelago each year. Top banner credit - Bernard Gagnon used under GNU1.2 license. Tell Me More About Travel and Tours to the Galapagos! These are representative, please use the form above to help us find your perfect tour. Tours leave year round and there are numerous departure dates for each cruise vessel and itinerary.